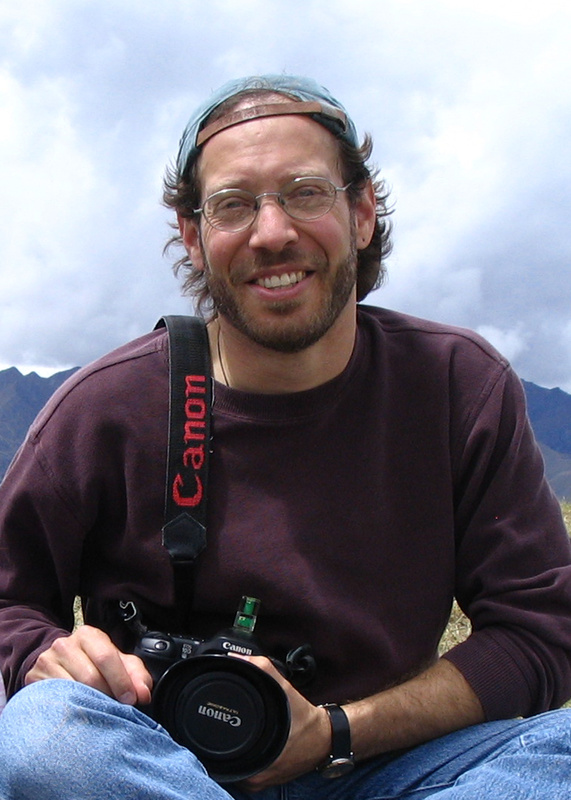 Anyone who’s taken my Writers Digest webinar on writing science fiction, fantasy and the paranormal or who’s taken one of my worldbuilding workshops will have heard me quote David B. Coe, who is a wonderful writer, blogger and teacher of all things writing. 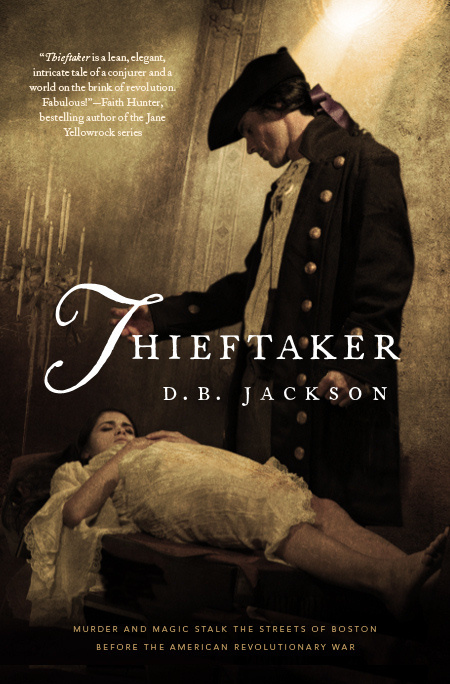 He’s a regular contributor to Magical Words, which has a lot of amazing advice for writers and, as you’ll see from the post below, the author of the “tricorn punk” Thieftaker series, beginning with THIEFTAKER and moving on to THIEVES’ QUARRY under the name D.B. Jackson. 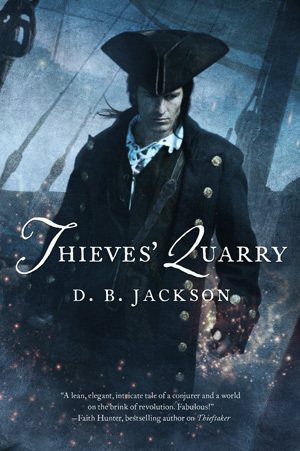 THIEVES’ QUARRY is just out today, so let’s wish him a happy book birthday! I have been writing historical urban fantasy for several years now, after beginning my career as an author of alternate world fantasies (under the name David B. Coe). As I have settled in to this new phase in my career, I have found, to my surprise, that establishing a historical setting for my Thieftaker books is not very different at all from worldbuilding for my older series. In both cases, I need to establish for my readers a sense of place and time, so that they feel the setting has substance and meaning; I have to write to all of their senses, using my descriptive passages to make the setting come alive; and I need to weave the backdrop into my storytelling, so that the world in and of itself becomes a player in my narrative. The key to meeting these challenges lies in my use of point of view. A brief primer on point of view: Point of view is the unique perspective through which a story is told. In today’s literary marketplace, point of view is tied inextricably to character. Novels and stories are expected to have, at any given time, but a single point of view character. So, for instance, in the Harry Potter books, Harry is almost always the point of view character. We experience the story line, the other characters, and the world J.K. Rowling has created through Harry’s eyes. His emotions, sensations, and intellect color everything that we read. Once upon a time — not that long ago, really — many writers wrote in what was known as omniscient voice, meaning that there was a detached narrator who told the story, giving us insights into the thoughts and emotions of every character in a scene. We would hop from one perspective to another, never really settling on a single perspective. That was considered the norm. Not anymore. Today, that approach is known as “head-hopping,” and it is frowned upon. An author can use more than one point of view character, as George R.R. Martin does in his Song of Ice and Fire series, but the transitions to new point of view characters need to be clearly delineated. And now, back to our regularly scheduled post . . . 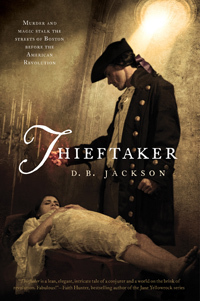 In my Thieftaker series, Ethan Kaille is my point of view character throughout every story and novel. My readers rely on Ethan’s descriptions, emotional reactions, and thoughts for clues as to how they should respond to all that happens. In my epic fantasies, I had many point of view characters. But what’s important is that in all these cases, my point of view narrators are the ones I depend upon to make my readers feel they are a part of the world I have established for the stories. I want to make my narrating characters tour guides in a sense. Which is not to say that they need to spend all their time walking backwards and telling my readers about the history of every building, monument, and alleyway. Rather, I want my characters to be immersed fully in their society and culture, so that when they interact with something that is unique to their time and place, my readers will not need to have that interaction explained to them. Its significance and its implications for my story should be clear from the context and from my point of view character’s responses. 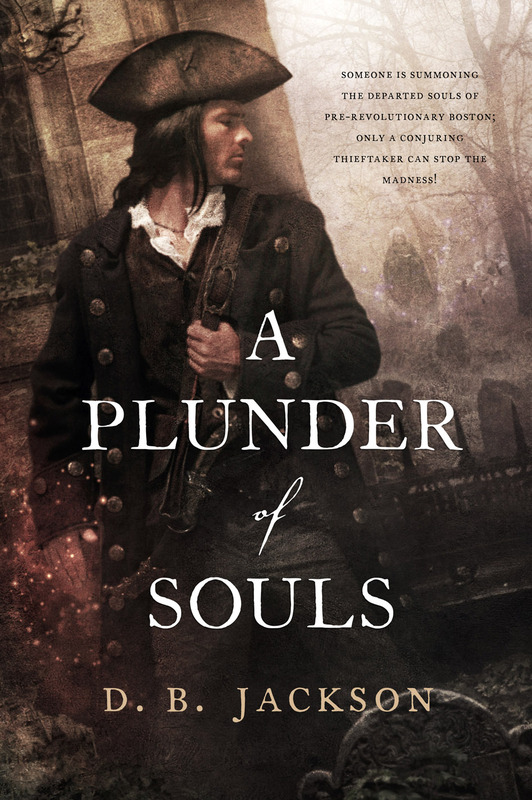 This post begins with a passage from Thieves’ Quarry, the second installment in my Thieftaker Chronicles, which is to be released by Tor Books on July 2. It is a short passage — exactly one hundred words long, as it happens — and it actually offers very little by way of historical information. That’s all right. It comes in the first few pages of the novel, at a time when I am not yet ready to burden my readers with too much data. But it does establish the mood that hung over the city of Boston at the time this story takes place. Those ships out on the harbor carry an occupying force of over a thousand British soldiers. For the first time in its history, after a summer of conflict and rioting, Boston is about to become a garrisoned town. Ethan’s thoughts don’t go into that level of detail, of course. They don’t have to. For the purposes of beginning to establish the tone and mood for my book, the small bit of information I give is sufficient. My readers can picture the ships, with their lanterns reflected on the harbor waters. And because of Ethan’s reaction to what he sees, they can guess that all is not well between the Colonists and the Crown. Aspiring writers are often told, “Show, don’t tell,” although just as often the exact meaning of this advice is left obscure. When we “tell,” we inject ourselves into our books, bypassing our point of view characters and instructing our readers in how they should respond to our writing. “Showing,” as opposed to telling, means allowing our point of view characters to respond to and interpret the places, other characters, and events that our readers encounter in the course of our narratives. It means describing sights, sounds, smells, tastes, textures as our characters experience them. We can do tons of worldbuilding or research, but if we don’t convey to readers why all that knowledge matters to our point of view characters, our settings will remain flat. On the other hand, when we show readers our worlds from the perspective of our characters, we make these settings — be they real world or imagined — something more than just a backdrop to our stories. They become our character’s home, or the alien land into which our heroine has just fallen, or the hellscape from which our hero is trying to win his freedom. Point of view gives dimension to our worlds by infusing our descriptions with emotion. It gives them context, weight, importance. And ultimately it makes them places to which our readers want to return again and again.